In 1215, Mongol armies from their capital in what is today Inner Mongolia, invaded and conquered Zhongdu. In 1271, Kublai Khan named the new dynasty Yuan and declared Zhongdu as his capital Dadu (Great Capital). With the final defeat and elimination of the Southern Song in 1127, China was finally reunified and Dadu was promoted to the political center of the entire country. During Kublai Khan’s rule(1260-1294), the city was drastically remodeled and rebuilt to include imperial palaces, city walls, moats and a canal, the Imperial Ancestral Temple, the Altar of Land and Grain and Tonghui Canal all owe their roots to their period. Kublai Khan’s new and improved rectangular Dadu measured 28 km around the perimeter, with a grid-system street pattern providing order and logic, and major streets measuring 24 paces across. 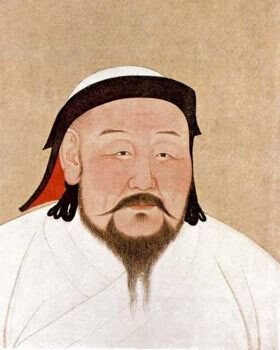 Kublai Khan (1215-1294). This founder of the Yuan Dynasty welcomed foreign trade.